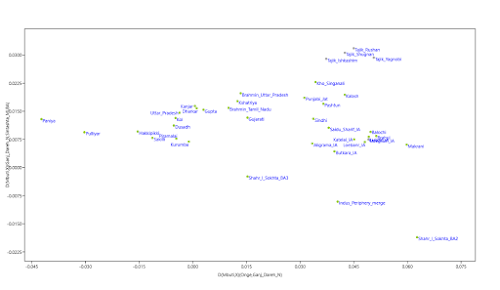 I computed a series of D-statistics on most of the currently available ancient samples from Central Anatolia - dating from almost the Epipaleolithic (Boncuklu_N) to the Hittite era (Anatolia_MLBA) - to try and get a better idea of who the Indo-European-speaking Hittites may have been. The full output as well as details about the key ancient samples used in this analysis are available here. See anything interesting? The most noteworthy statistics, I suppose, are those listed below, because they're significant (Z≥3) and organized chronologically. However, the thing to keep in mind in regards to D-statistics, and the very similar f4-statistics, when looking for signals of mixture is that they may or may not produce significant Z scores because of several reasons, such as the choice of the outgroup, the choice of the reference samples and the phylogenetic relationship between them, or even the type, quality and density of the data being used. 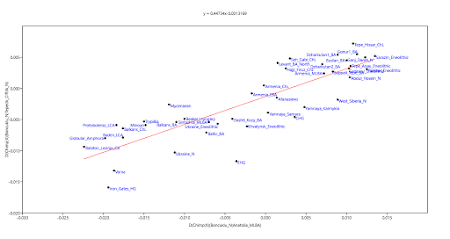 Perhaps ironically, the D-statistics above suggest that the Neolithic Central Anatolians (Boncuklu_N and Tepecik_Ciftlik_N) were more European-like than those from the Bronze Age, and I suspect that this is one of the main reasons why the idea of Eastern European admixture (from the Pontic-Caspian steppe and/or Balkans) in Hittites is currently being rejected by the geneticists working on the problem. But this dilemma is easy to explain away by the fact that the Neolithic samples carry much higher ratios of Anatolian Epipaleolithic hunter-gatherer admixture and also other types of ancestry shared with and/or closely related to European hunter-gatherers and early farmers. In other words, I'd say that most of the statistics are being confounded by deep phylogenetic relationships, and thus aren't very useful for solving the Hittite problem. 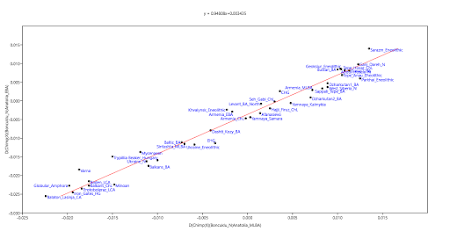 Interestingly, though, that relationship to Europe is reversed somewhat in the D-statistics involving Anatolia_EBA and Anatolia_MLBA, with the latter showing significantly higher affinity to Eastern European Hunter-Gatherers (EHG) and Minoans. Thus, in my opinion, to get a more complete picture it's also useful to look for patterns in the statistics, even those that, strictly speaking, don't reach significance. One way to do that is with linear models. So here are a few linear models based on some of my D-statistics. The relevant datasheet is available here. 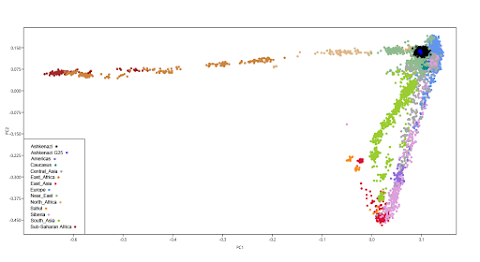 Arguably, the most striking thing about these models is the position at the top of the graphs of the ancient populations from Central Asia and what is now Iran, and the gradually lower position of populations with progressively less of this type of ancestry. The most plausible explanation for this phenomenon is post-Boncuklu_N gene flow into Central Anatolia from the east, possibly as a continuation of something that was happening already since the Epipaleolithic, but becoming more intense during the Neolithic revolution, probably as a result of rapid population growth in and around the Fertile Crescent. Indeed, I strongly suspect that one of the main reasons why we've been hearing so much lately about Iran as a likely candidate for the Indo-European homeland is this strong eastern signal in Bronze Age Anatolian DNA. If so, then this is likely to be a misunderstanding, because there are better explanations for it than the Indo-Europeans, such as the Hattians and Hurrians. 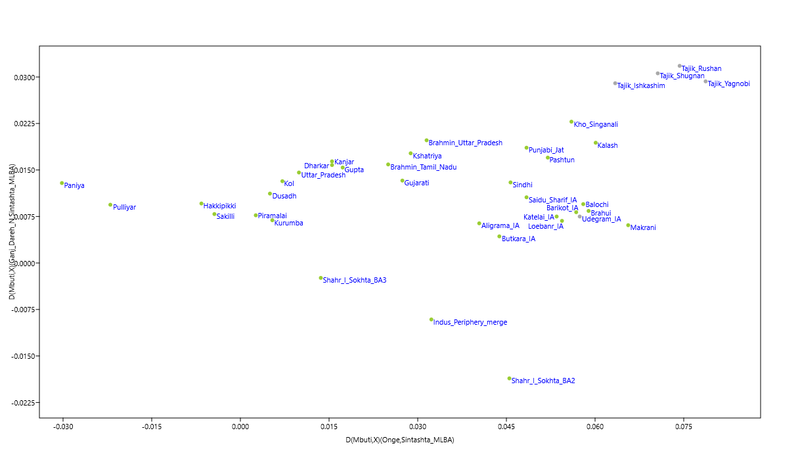 Another rather obvious outcome in my graphs is the relatively stronger affinity between the Bronze Age Anatolians and the ancient populations from Eastern Europe, including, and especially, those from the Pontic-Caspian steppe, compared to Tepecik_Ciftlik_N. In fact, looking at the Anatolia_EBA vs Tepecik_Ciftlik_N graph, I'd say that steppe admixture was already seeping into Central Anatolia during the Early Bronze Age. If so, this is an important point that should be taken into account when modeling the ancestry of the Hittite era Anatolians. That's because if Anatolia_EBA already harbored some steppe ancestry, then we'd be shooting ourselves in the proverbial foot if we were to use it as the supposedly unadmixed reference population to try and determine whether Anatolia_MLBA was partly of steppe origin. Hence, to model the ancestry of Anatolia_MLBA, at least in the context of possible migrations from the steppe to Anatolia during the Bronze Age, it might be more useful to use Tepecik_Ciftlik_N as the likely unadmixed reference population. 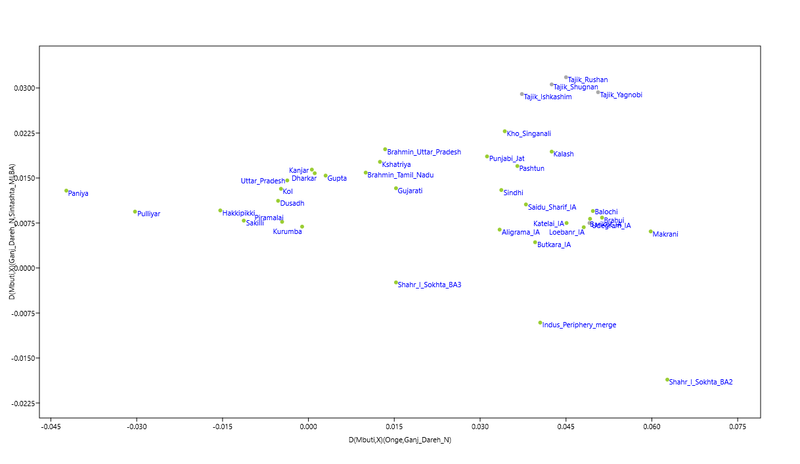 Let's try that with qpAdm, first on the whole Anatolia_MLBA set, and then on one individual labeled MA2203, who, as far as I can tell, shows an elevated level of steppe ancestry in several different types of analyses. I chose Yamnaya_Kalmykia as the potential mixture source from the steppe because it's likely to be the closest available population in my dataset to the Eneolithic groups of the southern region of the Pontic-Caspian steppe. Please note, however, that these mixture models are based on f4-statisctics. So, obviously, they're going to be affected by the same factors as described above that affect f4-statistics. Hence, despite the seemingly statistically sound output, the steppe admixture that you see there might not actually be admixture from the steppe. In fact, there's a good reason why I'm not shouting from the rooftops that I've just uncovered the presence of steppe ancestry in Bronze Age Anatolia, and thus confirmed the steppe or kurgan hypothesis positing that the Hittite and indeed Indo-European homeland was located in the Pontic-Caspian steppe. That's because I used a mixed bag of UDG-treated capture data and non-UDG-treated shotgun data. This is known to be a serious problem, which can skew the results of even the most robust analyses, and produce spurious statistics and Z scores. Nevertheless, I'm reasonably confident that my findings will eventually be confirmed with more and higher quality data from ancient Anatolia. Let's wait and see. 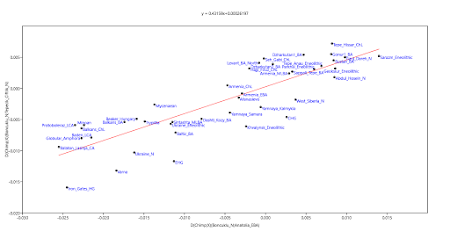 To produce the intra-North European Principal Components Analysis (PCA) plot below, download this datasheet, plug it into the PAST program, which is freely available here, then select all of the columns by clicking on the empty tab above the labels, and choose Multivariate > Ordination > Principal Components or Discriminant Analysis. 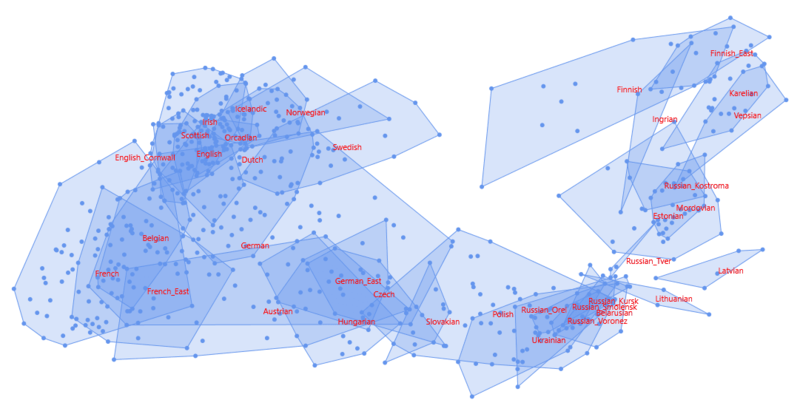 I'd say that the result more or less resembles a geographic map of Northern Europe. 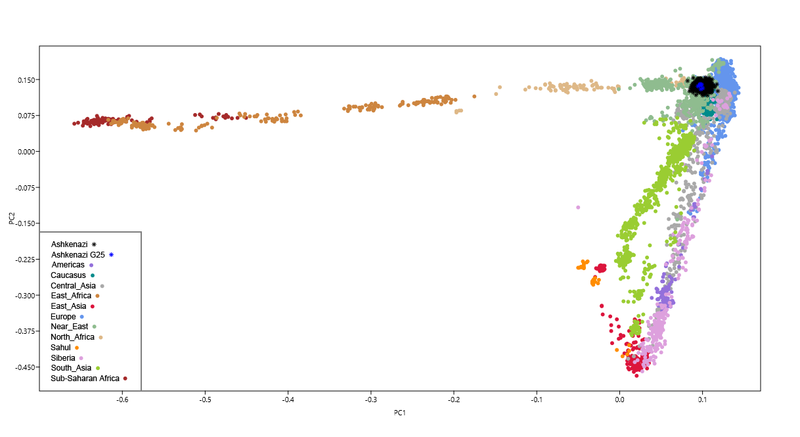 Of course, if you're in the possession of your own personal Global25 coordinates, you can add yourself to this plot to check whether your position matches your geographic origin. Please keep in mind, however, that the vast majority (>90%) of your ancestry must be from north of the Alps, Balkans and Pyrenees to obtain a sensible outcome. Also please ensure that all of the columns in the datasheet are filled out correctly, including the group column, otherwise your position on the plot will be skewed. I'm sometimes asked in the comments here and elsewhere what I think of Carlos Quiles and his Indo-European website (see here if you're game). Discussing this topic is a waste of time and effort, so I'm writing this blog post for future reference just in case this question comes up again. In all honesty, I think Carlos is a troll and his ramblings are of no value. Ancient DNA has revolutionized our understanding of prehistoric Europe, particularly in regards to one crucial, controversial and hotly debated topic: the origins of the Corded Ware Culture (CWC) and its people, who, during the Late Neolithic, came to dominate vast stretches of Europe all the way from the North Sea to the forest steppes of what is now western Russia. Thanks to ancient DNA from burials associated with the CWC and those of preceding archaeological cultures, there is now a very strong academic consensus that the CWC was introduced into Northern Europe by migrants from the Pontic-Caspian (PC) steppe. It's also widely accepted that these migrants were rich in Y-chromosome haplogroup R1a and, in terms of genome-wide genetic ancestry, shared a very close relationship with the Yamnaya people who lived on the PC steppe at around the same time. The question of the linguistic affinities of the CWC is still a controversial issue. It has to be, because assigning languages to long dead, illiterate cultures is a tricky business. But the generally accepted view that the CWC was the first Indo-European-speaking culture in Northern Europe has certainly gained strength thanks to the ancient DNA data, which has revealed an intimate genetic relationship between the CWC people and present-day Indo-European speakers of Northern and Eastern Europe and South Asia. - and the CWC people weren't really all that closely related to the Yamnaya people anyway, except maybe for some minor admixture via female gene flow, because obviously they didn't come from the PC steppe. 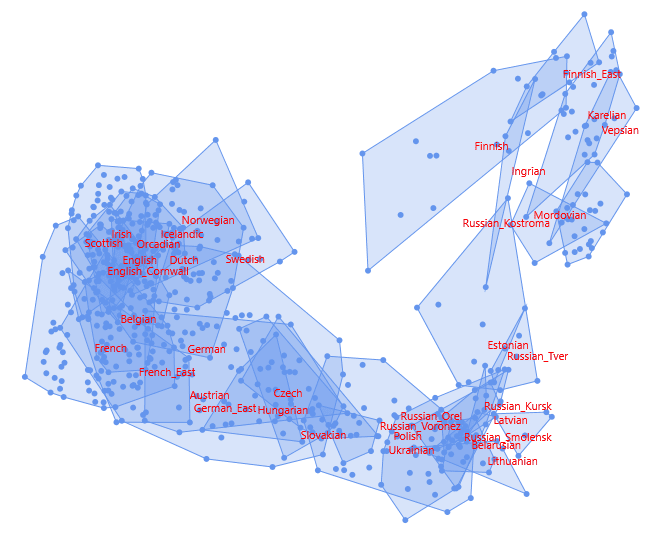 Oh, wait, that map is from the Copenhagen group of academics that Carlos accuses of pushing the false narrative. Maybe it's rigged? Perhaps this is all a conspiracy, and Carlos is the only one fighting the good fight? Nah, it's more likely that Carlos is hopelessly confused by the genetic data, which he is unable to comprehend and interpret, let alone analyze himself. Is the computer still too busy to run anything Carlos? Maybe one day, eh? At the risk of suffering significant brain rot, let's wrap things up with a quick look at a couple of Carlos' somewhat comical attempts to expose and challenge the supposedly false mainstream narrative. Back in 2017, Jones et al. authored an ancient DNA paper on the genetic prehistory of the East Baltic region titled The Neolithic Transition in the Baltic Was Not Driven by Admixture with Early European Farmers (see here). One of the key samples in this paper was Latvia_LN1, a female from an early CWC burial. I keep expecting that more information is given regarding the important sample labelled “Late Neolithic/Corded Ware Culture” from Zvejnieki ca. 2880 BC. It seems too early for the Corded Ware culture in the region, clusters too close to steppe samples, and the information on it from genetic papers is so scarce… My ad hoc explanation of these data – as a product of recent exogamy from Eastern Yamna -, while possibly enough to explain one sample, is not satisfying without further data, so we need to have more samples from the region to have a clearer picture of what happened there and when. Another possibility is a new classification of the sample, compatible with later migration events (a later date of the sample would explain a lot). Blah, Blah...please let it be a mistake, says Carlos (see here for the full treatment if you're game). But surely for anyone who understood all of the relevant ancient data available at the time, this was the expected outcome. It certainly was for me. 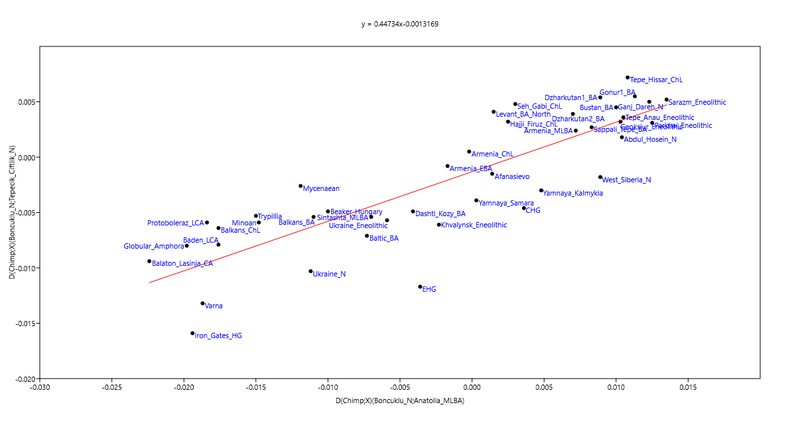 That's because the CWC samples sequenced to date showed very high genetic affinity to Yamnaya, and, on average, more than 70% admixture either from Yamnaya or a very closely related source. If we take the most recent reliable radiocarbon analyses of material culture, and interpretations based on them of Corded Ware as a ‘complex’ similar to Bell Beaker (accepted more and more by disparate academics such as Anthony or Klejn), it seems that the controversial ‘massive’ Corded Ware migration must have begun somehow later than previously thought, which leaves these early Baltic samples still less clearly part of the initial Corded Ware culture, and more as outliers waiting for a more precise cultural context among Late Neolithic changes in the region. Controversial? Only in his mind. As far as I'm able to understand his ramblings (see here for the full treatment if you're still game), he attempts to explain these samples as either Yamnaya individuals who were wrongly associated with the CWC, or female Yamnaya migrants who ended up in CWC territory as a result of long range female exogamy between Yamnaya and CWC populations. What he apparently failed to notice was that one of these samples, labeled Gyvakarai1, was a male who belonged to R1a-M417. Oops. 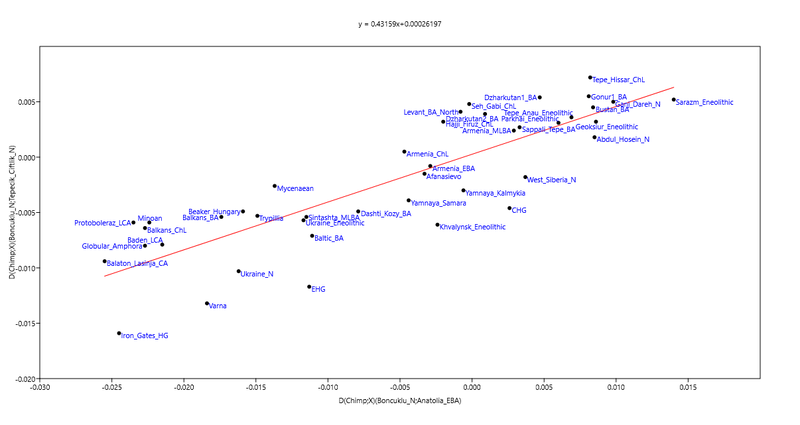 Before the Indo-Europeans and Austroasiatics got to South Asia, probably well within the last 4,000 years, it's likely that all of the genetic variation in the region basically sat along a genetic cline devoid of any Bronze Age steppe and Southeast Asian ancestry, like the one in the Principal Component Analysis (PCA) below running from the Paniya to the "Indus Periphery" ancient sample Shahr_I_Sokhta BA2. Note that almost all of the South Asian populations, including the Iron Age (IA) Swat Valley groups, are clearly peeling away from the said cline towards the Tajiks, in other words towards Central Asia. This is a reflection of the widespread presence of Sintashta-related steppe admixture among South Asians, especially those speaking Indo-European languages. Moreover, the Bangalis and Burushos are being pushed towards the top left of the plot as a result of East Asian-related ancestry. In the case of the former, this is largely due to gene flow from Austroasiatic groups. It'll be interesting to see how ancient Harappans behave in this analysis. I'm betting that they'll be very similar to the Indus Periphery trio, although judging by the latest press report on the topic (see here), the Harappan samples from Rakhigarhi might be shifted much closer to the Paniya as a result of a higher ratio of indigenous South Asian ancestry. The PCA is based on my Global25 test. If you're South Asian and in the possession of Global25 coordinates, you can add yourself to this plot using the datasheet available here. Plug the datasheet into the PAST program (freely available here), select all of the columns, and go Multivariate > Ordination > Principal Components (PCA). Update 10/08/2018: I managed to almost reproduce my PCA with a graph based on D-stats of the form D(Mbuti,X)(Onge,Ganj_Dareh_N)/D(Mbuti,X)(Ganj_Dareh_N,Sintashta_MLBA). Admittedly, Gonur2_BA didn't want to cooperate by pushing slightly up and away from the ghost South Asian cline. 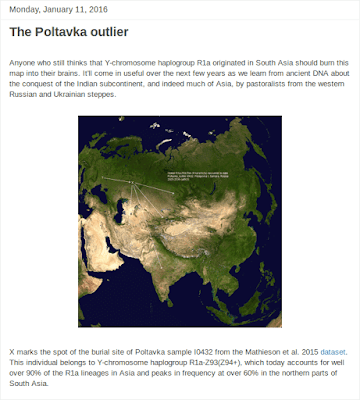 But this may have been due to a lack of data or perhaps minor admixture (keep in mind that this sample is actually from Turkmenistan and not South Asia). 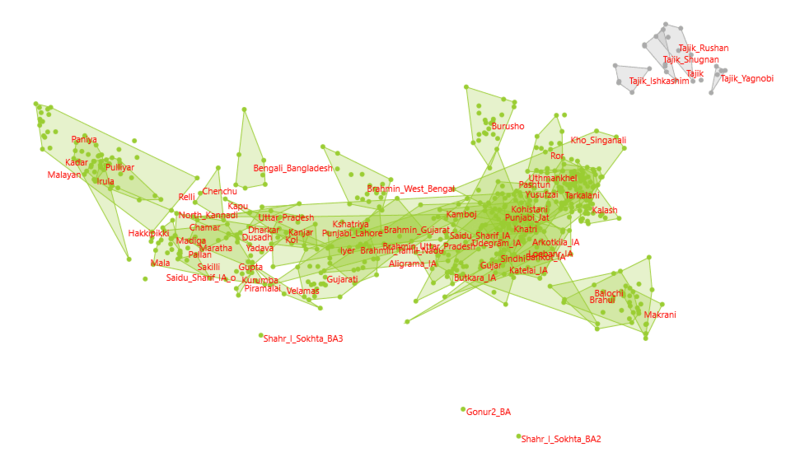 However, combining all three of the Indus_Periphery individuals worked well enough. The relevant datasheet is available here. The Rakhigarhi ancient DNA paper is coming soon. Very soon. Yep, you've probably read this sort of thing many times in the last few years, including here. But this time, by all accounts, it's really happening. For the latest Indian press teaser on the topic check out: We Are All Harappans. At least I don't have to write up a blog post for the occasion, because I already wrote one over two years ago, and it's still current, more or less. Click on the screen cap below to teleport yourselves back to January 2016. And make sure to peruse the comments under the article. Hilarious stuff. The morphological similarities/dissimilarities between antler and bone-made cheekpieces have been employed in several studies to construct a relative chronology for Bronze Age Eurasia. Believed to constitute a part of the horse bit, the cheekpieces appear in ritual contexts everywhere from the Mycenaean Shaft Graves to the Bronze Age kurgan cemeteries in Siberia. However, these general understandings of the function and morphological changes of cheekpieces have never been rigorously tested. This paper presents statistical analyses (e.g., similarities, multidimensional scaling, and cluster analysis) that document differences in cheekpiece morphology, comparing shield-like, plate-formed, and rod-shaped types in the context of temporal change and spatial variation. We investigated changes in function over time through the use of experimental replicas used in bridling horses. This experimental work supports the hypothesis that these objects served to bridle harnessed (shield-like) or ridden (plate-formed and rod-shaped) horses. 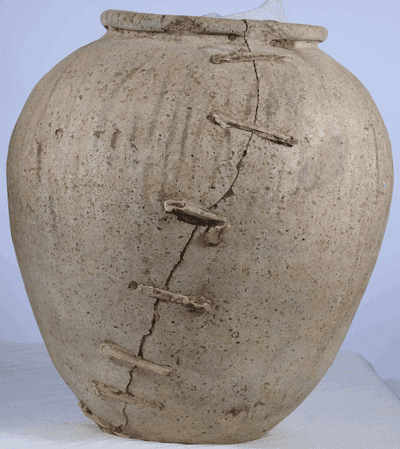 Moreover, comparison of use wear on the ancient artifacts with the replicas provides insight into how long the artifacts were used before they were deposited in the funeral contexts or discarded. These observations support that the Sintashta chariots dating back to ca. 2100 BC were ridden and suggest the end of the Late Bronze Age (ca. 1500–1200 BC) as the earliest possible date for horseback riding in warfare. This study highlights changes in horse exploitation and simultaneous shifts in human societies. From around 4,000 to 2,000 BC the forest-steppe north-western Pontic region was occupied by people who shared a nomadic lifestyle, pastoral economy and barrow burial rituals. It has been shown that these groups, especially those associated with the Yamnaya culture, played an important role in shaping the gene pool of Bronze Age Europeans, which extends into present-day patterns of genetic variation in Europe. Although the genetic impact of these migrations from the forest-steppe Pontic region into central Europe have previously been addressed in several studies, the contribution of mitochondrial lineages to the people associated with the Corded Ware culture in the eastern part of the North European Plain remains contentious. In this study, we present mitochondrial genomes from 23 Late Eneolithic and Bronze Age individuals, including representatives of the north-western Pontic region and the Corded Ware culture from the eastern part of the North European Plain. We identified, for the first time in ancient populations, the rare mitochondrial haplogroup X4 in two Bronze Age Catacomb culture-associated individuals. Genetic similarity analyses show close maternal genetic affinities between populations associated with both eastern and Baltic Corded Ware culture, and the Yamnaya horizon, in contrast to larger genetic differentiation between populations associated with western Corded Ware culture and the Yamnaya horizon. This indicates that females with steppe ancestry contributed to the formation of populations associated with the eastern Corded Ware culture while more local people, likely of Neolithic farmer ancestry, contributed to the formation of populations associated with western Corded Ware culture. We investigated the within- and between-group variability using an AMOVA analysis. Concentrating on the eastern and western Corded Ware groups, we found the best variability distribution when the individuals associated with the western Corded Ware culture (CWW in Supplementary Table S5) were grouped together with the Middle Neolithic/Bronze Age Central Europe groups, while individuals associated with the eastern and Baltic Corded Ware culture (CWPlM, CWBal), and Yamnaya horizon groups (YAW and YAE) clustered together with the eastern Europe populations (from the Middle Neolithic-Bronze Age) (4.68% of variability among groups, 3.04% among populations within groups). By analyzing ancient mitochondrial genomes, we show that people from the eastern and western Corded Ware culture were genetically differentiated. Individuals associated with the eastern Corded Ware culture (from present day Poland and the Czech Republic) shared close maternal genetic affinity with individuals associated with the Yamnaya horizon while the genetic differentiation between individuals associated with the western Corded Ware culture (from present-day Germany) and the Yamnaya horizon was more extensive. This decreasing cline of steppe related ancestry from east to west likely reflect the direction of the steppe migration. It also indicates that more people with steppe-related ancestry, likely both females and males, contributed to the formation of the population associated with the eastern Corded Ware culture. Similarly, closer genetic affinity to populations associated with Yamnaya horizon can be observed in Baltic Corded Ware groups, which confirms earlier indications of a direct migrations from the steppe not only to the west but also to the north, into the eastern Baltic region [18,19,55]. The mitochondrial data further suggests that with increased distance from the source populations of the steppe, the contribution of local people increase, which is seen as an increase of maternal lineages of Neolithic farmer ancestry in individuals associated with the western Corded Ware culture. Interestingly, hg U4c1 found in the Yamnaya individual (poz224) has so-far been found only in two Bell Beaker- associated individuals  and one Late Bronze Age individual from Armenia , which might suggest a steppe origin for hg U4c1. A steppe origin can possibly also be assigned to hg U4a2f, found in one individual (poz282) but not reported in any other ancient populations to date, and to U5a1- the ancestral lineage of U5a1b, reported for individual poz232, which was identified not only in Corded Ware culture-associated population from central and eastern Europe [55,61] but also in representatives of Catacomb culture from the north Pontic region , Yamnaya from Bulgaria and Russia [17,46], Srubnaya  and Andronovo  -associated groups. Hg U2e, reported for Late Eneolithic individual (poz090), was also identified in western Corded Ware culture-associated individual23 and in succeeding Sintashta14, Potapovka and Andronovo  groups, suggesting possible genetic continuity of U2e1 in the western part of the north Pontic region. Hgs W3a1 and W3a1a, found in two Yamnaya individuals from this study (poz208 and poz222), were also identified in Yamnaya-associated individuals from the Russia Samara region  and later in Únětice and Bell Beaker groups from Germany [61,63], supporting the idea of an eastern European steppe origin of these haplotypes and their contribution to the Yamnaya migration toward the central Europe. The W3a1 lineage was not identified in Neolithic times and, thus, we assume that it appeared in the steppe region for the first time during the Bronze Age. 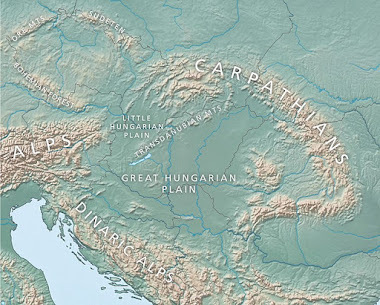 Notably, hgs W1 and W5, which predate the Bronze Age in Europe, were found only in individuals associated with the early Neolithic farmers from Starčevo in Hungary (hg W5)64, early Neolithic farmers from Anatolia (hg W1-T119C) , and from the Schöningen group (hg W1c)61 and Globular Amphora culture from Poland (hg W5) . I know that some of you are looking at the genetic structure of Ashkenazi and other Jewish populations with the Global25 data. So to help things along here are Global25 coordinates for 471 Ashkenazi individuals from Bray et al. 2010 (see here). I don't know what the genotyping accuracy is for these samples. 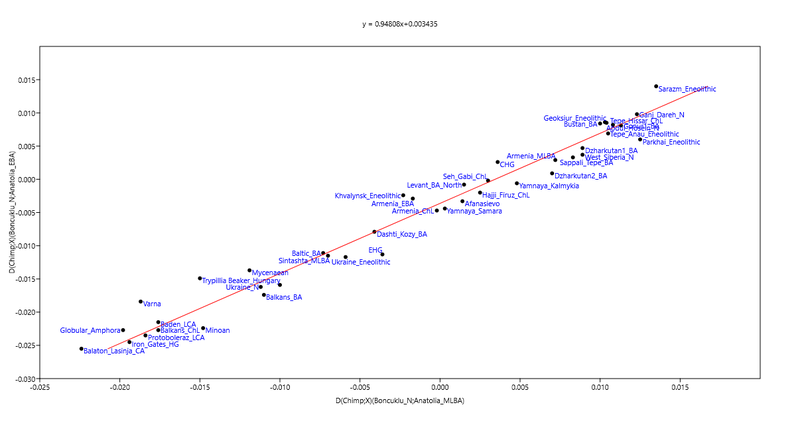 It's probably very accurate, but just in case, considering their age, it might be useful to remove the most extreme outliers before trying any fine scale analyses. In any case, on average, they're very similar to the Ashkenazi Global25 reference panel. To illustrate the point, below is a plot based on the above PAST datasheet. Indeed, across all 25 dimensions their lowest distance is to the Ashkenazi Global25 reference panel, followed by various Mediterranean populations. So it seems that everything makes sense.